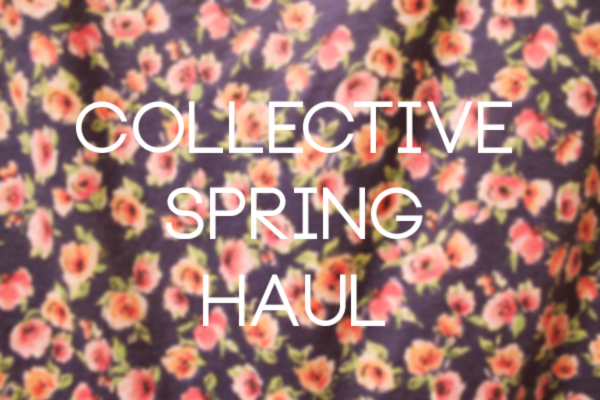 I've been stocking up on some Spring essentials the last few months, and I thought it was time to do a huge collective haul for you all! Now, keep in mind, I didn't buy all of this at once--this has been going on since January. Also, this was all bought with my own money. I told myself I needed more prints in my wardrobe and before I knew it, I had bought floral print everything. I have to stop myself from buying more before I start to bleed roses instead of black. I bought this brown sheer floral blouse from Vinted because it's long and it's great for layering things under and over. I decided on this vintage blouse because the colors are to die for, and I love the exaggerated collar and funky floral print. The third floral blouse I bought strictly for layering clothes under it. It's straight polyester which makes it feel like a raincoat, and it's quite water resistant. And, lastly, this gorgeous intricate blouse is from Vinted. I wore it here and it's so undeniably demure. 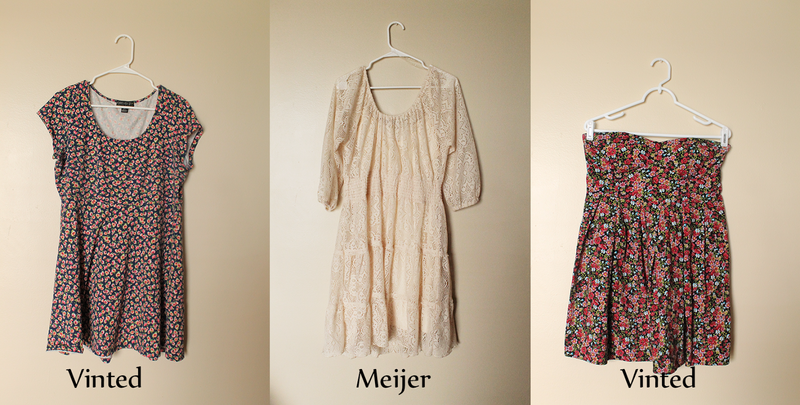 I went a bit crazy with florals in the dresses as well. 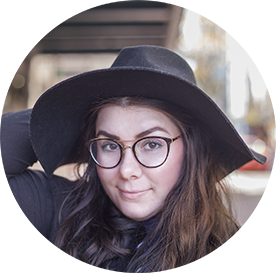 The first one is my favorite of the bunch--it's short, flattering, and has that cuteness to it. I wore it here, and I love it. The lace dress is boho epitomized and is perfect for a brunch at your favorite patio cafe or just lounging around the house. It's comfy, lovely, and it looks great on any size! The strapless dress is cute, flirty, and can be dressed casually really easily. 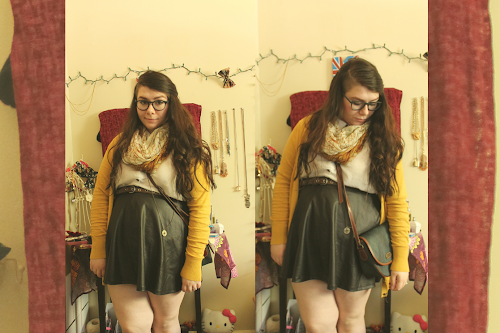 The yellow ruffle skirt is so cute and flattering, and it screams spring so I just had to get it. 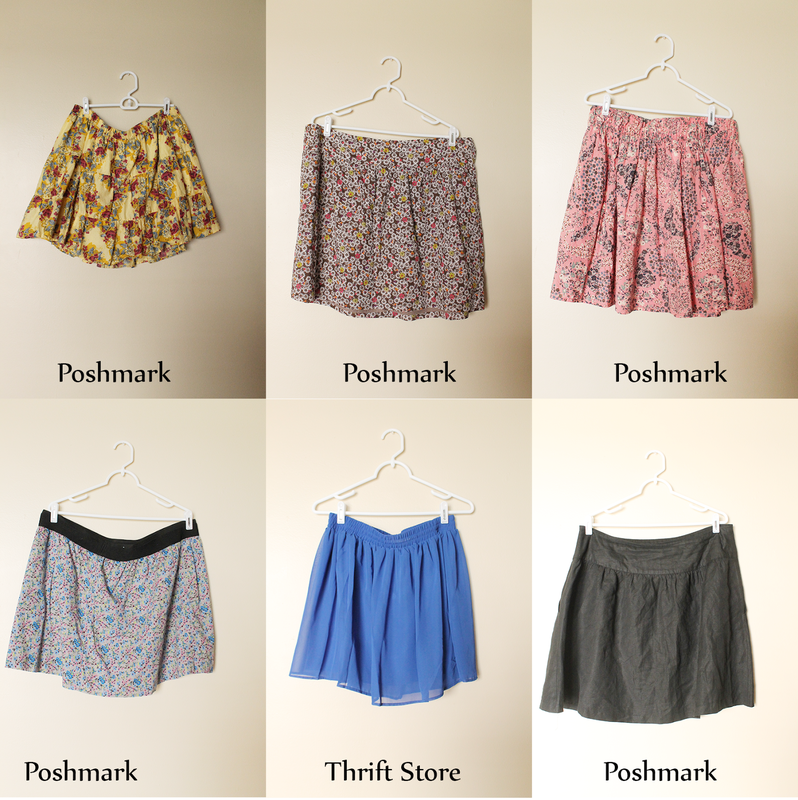 And, the follwoing three skirts I got in a bundle from a seller on Poshmark. I was sick of having a plain skirt collectios, so why not add some floral to my bottom half as well? The blue skirt is a cute skirt I thrifted that's the perfect length, and the skater skirt is from Poshmark, and I wear it too often to be proud. It's warming up here in Indiana, and though it may be the rainy season, it's still crop top season. I bought this striped one from Forever 21's online shop a month or so ago, and it's so cute. It's very nautical. The bustier is going to look perfect paired with a high waist skirt when it really warms up! I got this crochet eyelit tie up crop top at the thrift store and it's literally perfect. This graphic tee is surprisingly good. I bought it for the print, but it's easily dressed up or down. When I saw this fringe tribal vest, I knew I had to have it. It's going to look so great this summer, and it's beyond soft. This flannel is so comfortable and lovely that I wear it out a lot. 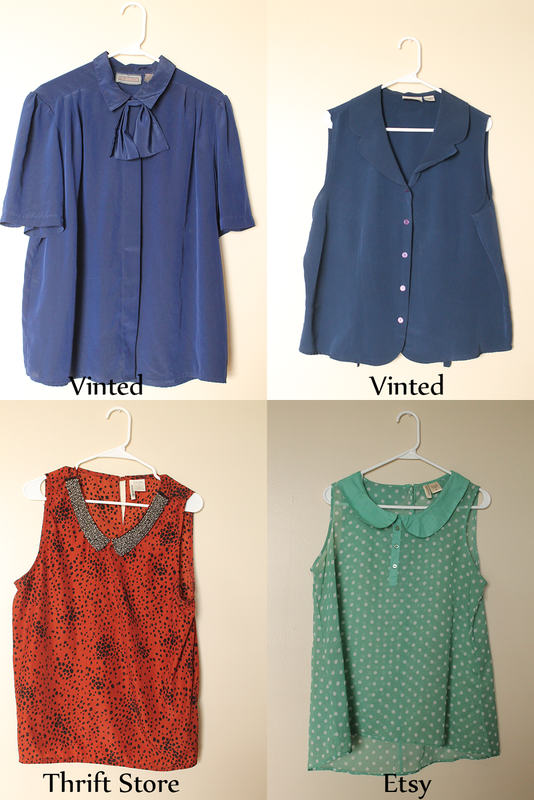 The top two navy blouses are from Vinted, and though the colors the same, the cut and styles are totally different. I love the bow and sleeves on the first one, and the peter pan collar on the second blouse looks great with a cardigan layered over. 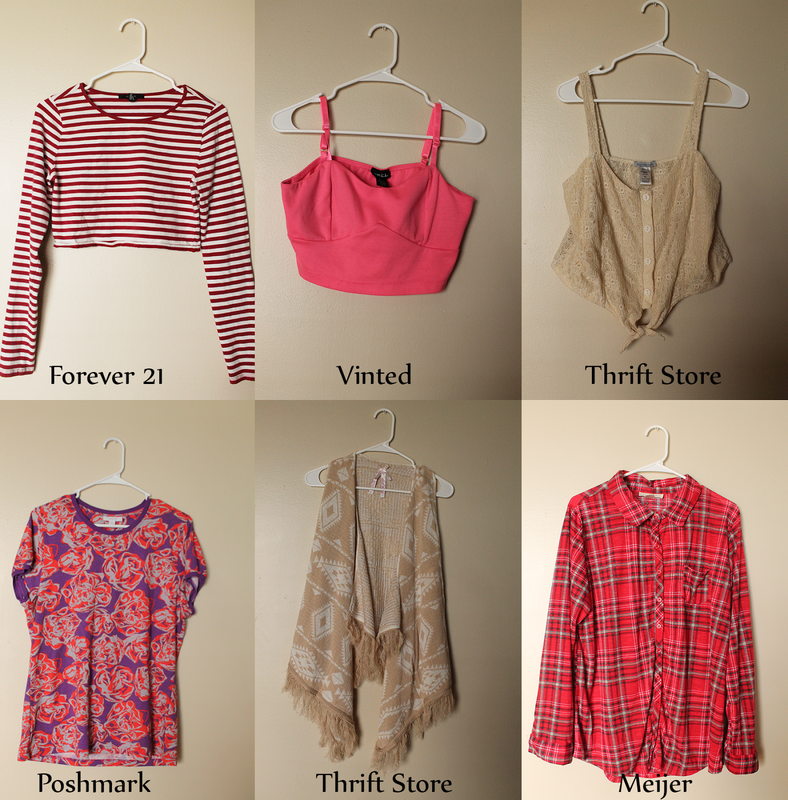 Surprisingly enough, the last tow blouses are by the same brand, but I bought them form tow different places. I bought this abstract print blouse with a bedazzled collar from the thrift store, and I'm waiting for an opportune moment to bust it out. The second one I bought from someone's Etsy store who was having a clear out. She's now closed, but I managed to score it for cheap. Also, the color is perfect for spring. These plaid flats from Vinted were discounted and too cute to pass up. I have yet to wear them because the ground has been wet and soggy, but I know that they're going to get some use. And, my Doc Martens dupes are too perfect. I thrifted them and I love them so much. Lastly, I have my satchel from Poshmark. 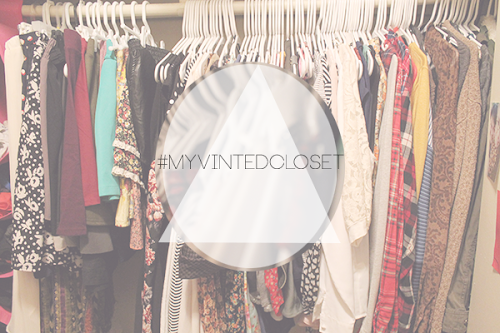 It's probably my favorite piece out of all of these because it's spacious and cute. What are you recent purchases? Share them with me!